The New Year means new eating habits and trying to get healthy and I always make that a goal every year but have yet to keep the momentum going after two months. This is the year I am going to try again starting February 2017 and see what I can accomplish. 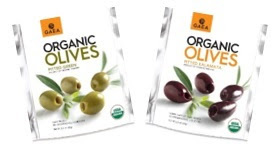 One food item I forget is good for you is GAEA Organic Olives this 2.3 oz. snack packs are perfect to throw in your bag and so convenient in a resealable bag with on liquid and 100% natural without zero additives or preservatives. 80 or 140 calories which are low calorie, a source of dietary fiber and copper, rich in Vitamin E and contain mono-unsaturated fatty acids and polyphenols. Pitter Green Olives Organic Halkidiki olives are handpicked from organically cultivated trees. Green Olive Spread a strictly authentic Greek meze recipe made by the superb Halkidiki olives and top quality Extra Virgin Olive Oil. Flavored with natural ingredients such as coriander, lemon juice, basil, and garlic. My Opinion: The spread is perfect for pita bread and chips and the taste is ok along with the snack packs. These are also great to snack on for Super bowl LI and use the green olive spread for crackers and more.